The sign that is no more. As we approached the tiny hilltop village of Montsegur-sur-Lauzon in northern Provence, my mouth was already watering in anticipation of the bread at the one and only boulangerie (bakery) there. I'd been looking forward to this for months, ever since last November, when we'd made one last stopover to load up on bread to sustain us for the long drive back home and a couple of days beyond. I've written about my love for this boulangerie before. The bread there was the best I've ever had - bursting with flavor and character. Even when the loaves turned a bit stale after a couple of days, they were still so good. I was convinced that if the baker, Monsieur Metaud, was in Paris, he'd be world famous. It was a Sunday, and there was a small queue of people waiting for their bread in the tiny store. Neither of the two people behind the counter, a young man and a middle aged woman, were Madame or Monsieur Metaud, but that didn't concern us - they had other people selling bread there before, especially on weekends. But as we shuffled closer to the front of the line, something seemed a bit off. The collection of exotic teas that used to line the wall shelves were gone. The pretty display of confections was quite pared down. Still, I spotted a sign stuck into a loaf that said baguettes au vin et à larosette, and breathed a sigh of relief. "Oh great, they haven't run out yet", I whispered. They often ran out of this, my favorite bread out of all of their excellent selection - a gutsy, salty, twisted loaf of goodness, faintly pink and grey from red wine, with chunks of rosette, a kind of Provençal salami, in it. We ordered a baguette traditionelle, a baguette au levain and a couple of those baguettes au vin et à la rosette, and exited the store rapidly. As usual, I tore off the end of one of the baguettes and popped it into my mouth as soon as I as outside. I stopped and stared into the bag. As we walked back to the car, I pulled out the whole loaf - smaller, as I'd already spotted, and darker than I remembered - and broke it in half. "Something's wrong" I frowned. Max, who was about to turn on the ignition, stopped and looked at me. "What do you mean, something's wrong?" "It's not the same bread at all", I held out a half of the loaf. "See, the rosette isn't in chunks, it's shredded. And the bread itself..." I took another bite, just to make sure. "It's just...ordinary." With a skeptical look Max tore off a chunk and chewed. "Hmmm..." he said. "Hmmm..." We looked at each other in dismay. Wordlessly, he took a ripped into the baguette traditionelle too, and handed me a piece. There was no doubt about it: this was not bread from the same baker. Leaving the loaves in the car we walked back to the bakery, still stunned. Now I noticed some more things. The window display was somehow different: instead of the imaginative and feminine arrangements I'd seen before (one I remember had lavender candies arranged like a lavender field with toy bees hovering over), there was a fairly standard basket of several loaves of bread. 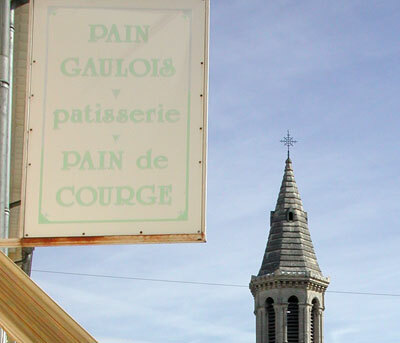 Outside the store, instead of the faded green on white sign proclaiming PAIN GAULOIS - PATISSERIE - PAIN DE COURGE, there was a metal Artisan Boulanger sign, that you see on the fronts of many bakeries (I'm not sure but I think it's some sort of franchise sign). "Do you think that it's really a different baker?" I whispered in dismay, as we peered into the store again. Now, the two people selling bread looked more like proprietors than hired help, somehow. Max scratched his head. We decided to get another loaf, any loaf, so that we could test it some more. We got an ordinary baguette. In the car, we munched thoughtfully, looked at the crust, examined the crumb. Don't get me wrong - it was a perfectly acceptable baguette. But it was not special anymore. The crumb was too even, lacking the interesting, gutsy holes. The crust, crusty yes, but not sharp and crackling and full of vigor. Occasionally Monsieur Metaud's baguettes were a bit on the too-salty side, which made them even more interesting in a way, but I felt that this new baguette was almost too bland. That day we drove away, rather stunned. Later on, we decided that questions needed to be asked. Maybe the baker just had an off day. We hoped, really hoped, that was the case. But somehow I already sensed it wasn't so. A few days later we drove back to the village, and went to the boucherie (butcher shop) on the other side of the village square - we felt rather awkward about trying to talk to the new people behind the counter in the boulangerie. There, we learned that Monsieur Metaud had indeed sold the boulangerie. He was living in a nearby town, but no longer baking. That magical bread that I had spent months dreaming about was no more. I can't deny that for a few minutes, I did feel some tears welling up. Crying over bread, or any kind of food that is no longer available, may seem silly to a lot of people. It seems a bit silly to me even. Still, there is a corner of my heart where I mourn those foods that I can no longer have, including that wonderful bread. The terrific hamburger that I used to have at a coffee shop that went out of business a decade ago. My first cassoulet, at a tiny restaurant in Toulouse that I can't remember the location of. The bright blue ice lollies I loved when I was seven. The turtle soup I had, at age eight, at a long gone country house restaurant in England. The delicate cuttlefish sushi with sea salt and yuzu prepared by an itamae-san who passed away. My grandmother's pickles. And lots, lots more. I may try to recreate some of those breads, especially the baguettes au vin et à la rosette, for myself. And there are other, terrific bakers out there of course - and we already discovered a couple, once we were left without the magic of M. Metaud's bread (I'll write about these shortly). But it isn't, and never will be, the same. It's never the same. This is why great food is such an elusive art form, that we can only experience in the now. We can listen to music that has been recorded, watch a great movie over and over again, or gaze at a wonderful painting. That astonishingly delicious mouthful can never be experienced like that again - and once the creator stops making it, it's gone forever. So when we are lucky enough to encounter great food, we need to savor it for all its worth, to imprint it as much as possible on our taste buds and in our memories. This is one of the reasons why I write about food, to keep a record of those precious, fleeting moments of pleasure. Submitted by maki on 2007-06-24 21:24. What a terrible thing to happen. Such a dissappointment, and such a shock to find out Monsieur Metaud is no longer baking! I know this feeling of rembering food that was soo good, and the obsession that comes with thinking about it when you are home again, and the ultimate sadness when you can't have the same thing again. Very sad. I am so sorry to hear that your baker retired, I know what you mean though. There was a place in my hometown that I loved, it had changed hands quite a few times while I was living at home and yet still kept the wonderful quality of food. Then while I was gone the owner just up and closed one day with out a word to anyone. A couple of months later someone else bought the place and reopened, and the food was absolutely horrible!!! That was worse then having it closed, b/c now that is the most recent food memory I have of the place, so sad. I cried salty tears also about the bread. And I had never tasted it. But bread is my desert island food, and I had even gone so far as to try and find accommodation in that little village with the bakery. Oh well. [sympathy] Andalusia Bakery was THE best bakery if not in South Florida, at least in Miami. Some psycho young male 'person' stabbed one of the baker/owners; it got sold to a younger go-getter, who quickly expanded it to about 4-6 stores, moved the bakery out to a larger facility out west, let the kosher license on the original kitchen expire!... and killed off the whole thing within two years. It seems to be a very French concept, to weep over lost food perfection. You are so right. When I was a little girl in Taipei, an elderly peddler would go through the neighborhood shouting, "Da Wei!" every morning - a combination of hot fresh soybean pudding and peanut soup. He carried each in a separate bucket balanced with a long pole over his shoulders. I can remember the shout, I can remember the fragance of the tofu and peanuts, but I am unable to ever taste his concoction again. My mom had arranged to watch him make it once, but she missed the 5am start time and never got the recipe. I cry every time I think about it. Reading your first entry on this bakery I had pretty much mentally packed my bags and bought a ticket to France... I was ever so disappointed to reach the end of the tale, and read of the sorrowful fate of this blissful boulangerie. I am planning in fact to visit this area of Provence quite soon. Do you have any recommendations for other tasty bread in the area? Has Metaud gone on to spread more yeasty cheer? This story made my heart ache. I have just returned from visiting an elderly friend who used to be a wonderful home cook. I came home with copies of her favorite recipes and a jar of her oft-praised canned tomatoes. I was astonished when she told me that that the tomatoes contained only three ingredients: tomatoes, salt and sugar. I am also a good cook, but I know for a certainty that no matter how carefully I follow her recipes, my food won't be the same. I need her hands and her heart for that. oh how I can relate to this! I guess I thoroughly understand how that feels when one of my all time favourite restaurant got closed down out of the blue, without me knowing any reason why. I love almost everything they have on the menu, and it's just..irreplaceable. I'm missing the taste of my favourite dishes and desserts there already. I don't think I'd ever get a remotely similar taste somewhere else. That, and not to mention the many memories I've had of eating together with my family there, and that place being the place I frequent on my dinner date with the person whom I'm engaged with now. it's just sad, I feel you. We just returned from a week in Montsegur Sur Lauzon. We ate daily at this bakery and found the woman to be quite lovely. She spoke no English and we spoke little French. I did not try the baguette but had pastries each day. We got coffee from the bar next door and sat outside...wondering how we were so blessed to be there at that very moment. I long to return!